It’s been a funny week one way and another: exciting and satisfying, disappointing and frustrating in turns. 1st December saw our first frost worthy of the name (I know I talked about one in October but that was hardly cold enough to count) and yesterday we woke to a very hard one by our standards, with temperatures down to -6°C overnight. Yesterday we had clear skies and a crisp but gorgeously sunny day, while today we are being treated to cold drizzle and around 1/3rd France is covered in snow. Ooh, the sun’s just come out! The week started well. I was asked by the town Tourist Office, entirely run by volunteers, if I would help them set up a web site. I registered a name (Chabris-tourisme.fr) and created a five page site to get them started and they loved it. The hard part came when I had to get the Tourist Office committee to do things like sign a bank mandate for the URL registration and site hosting. They promise it will be done but the hosting company is now starting to get agitated. The company is French, so I imagine they will understand that when someone says “tomorrow”, they mean it should be done by Christmas; certainly in January or February…..almost certainly! 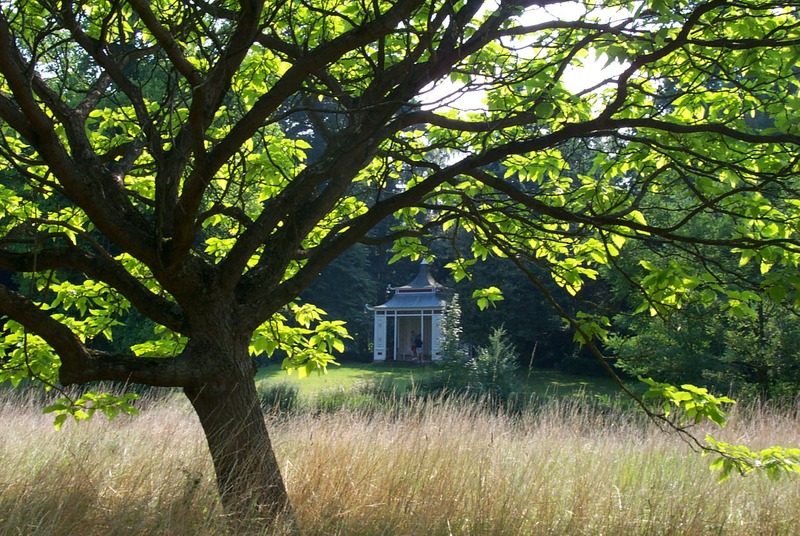 Ah well, that work is now on the back burner so I was able to get on with some web site additions of my own, adding an exciting new course to the Garden Design Academy program and featuring it as Course of the Month. Green Walls and Green Roof Gardening have been the subject of much interest lately and even the UK government is promoting their use in the cities as a response to the challenge to global warming. This course is timely therefore and we have high hopes for it both in the UK, where universities and companies have been researching the techniques for some time and in Europe, where a number of high profile examples have been constructed. Next week I hope to post details of another new course, much requested by the Industry: Horticultural therapy. I would have done it this week, but we had no power in the house Wednesday and it took all day to get it fixed. We woke up to a cold house and soon realised that we had a power cut of some sort. Electrical systems are different in France to what we are used to in the UK, but I did the rounds of the three circuit-breaker fuse boxes in various corners of the house before braving the cold to look outside where a box in the garden houses the incoming current and associated equipment. I could find no problem anywhere, apart from the lack of power. We rang EDF, our supplier, to explain our problem. The lady at the help desk who we spoke to after ten minutes, had us do the tour of the boxes again and concluded it was not her problem and that we should get an electrician in. We did so and he checked everything and confirmed it was an EDF problem as no power was getting to the house. Who’d have thought? We rang again and again, with the batteries of our mobile phones rapidly failing, but could not arrive at a point where someone was prepared to deal with the problem. Hearing a noise in the street, I noticed that EDF engineers where working outside the football stadium around the corner. I begged, pleaded and exaggerated in bad French until one of the team agreed to help. He spent the next few hours in the freezing rain, me holding an umbrella, trying to work out what needed to be done but eventually he concluded that a slug or snail had crawled in overnight and passed across two live contacts, frying the electrical system and ruining its chances of a merry 2013. By the end of the day we had power and more importantly heat, and life slowly returned to some semblance of normality. Yesterday seemed hardly more productive but at the same time fantastically so. I have had eye problems since the age of fourteen, nothing that could not be corrected by spectacles, you understand, but five years ago I had a series of operations which, amongst other things removed cataracts in both eyes. Apparently that was not the end of it and I needed laser treatment as part of a standard further stage in the long running saga. This work was completed at a clinic in Tours yesterday and now I can see again – the difference in my eyesight is quite incredible! It took all day, of course, and I was ready for an early night by nine o’clock, but it’s done now and I can start reading again without a magnifying glass and a glass of fortifying spirits. What a relief! Earlier in the week I had another challenging day. Someone pointed out that the contact form on our ‘all singing, all dancing’ Garden Design Co. web site was not working and we concluded that it had not done so for a long while, perhaps explaining why Elton John has not asked me to redesign his garden. Looking at the site for the first time in ages, we have decided it is in need of a complete overhaul so I spent several hours trawling the internet for inspiration. Finding something we thought suitable, I then set about designing a new site based on this design, only to find that the programming required to achieve the clever effects which so attracted us was completely beyond my capabilities. I started again with our second choice but ran up against the same set of problems: Flash coding is not something I understand. Finally I settled on a third design and found I could do everything required to achieve it after a bit of a struggle. I sent a copy to my son, a professional web site designer, who informed me at great length why he hated it. Fortunately we live in a wine producing area and have several hundred bottles in the cellar! He’ll love it when it’s finished. In the garden, we are pleased to have Helleborus niger in flower by the front step, the traditional place to have it ward off evil spirits. Another was given to us as a present last week, a variety in the Helleborus Gold Collection called HGC Jacob and no doubt available from a garden centre near you. I shall be interested to note the differences between these two as the season progresses but at the moment my little plant has larger flowers (actually only one) while the new one has a large number of smaller flowers. The new plant has been micropropagated and cultivated under protection so it will take a while for it to settle down and show how it really grows under garden conditions. One of the plants may end up being planted under our Sequoia tree. When a student from some distant shore enrols with the Garden Design Academy it is an opportunity to look at what we grow and see what plants might be familiar to gardeners in that country. A group of South Africans have booked for a two week residential garden design course and I have been out in the garden looking for plants native to the Cape and surrounding regions. My Grandmother lived in colonial South Africa and my Father was born in Cape Town, giving this region, which I have never visited, an extra interest to me. Our sunny, central island bed seemed a likely area to start and just three plants from the house-end of this bed comes our first discovery: Dierama or Angel’s fishing rod. 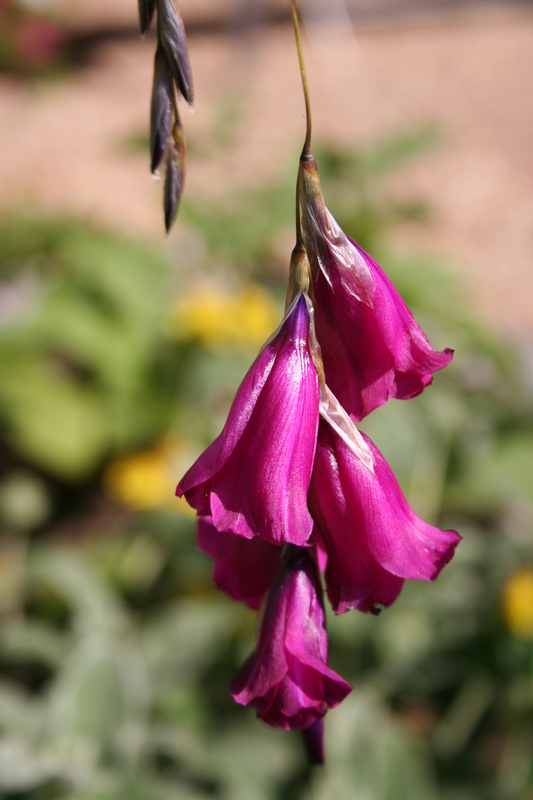 There are around 50 species of Dierama in the Eastern Cape and I have always assumed mine is D. pulcherrimum, though I stand to be corrected. 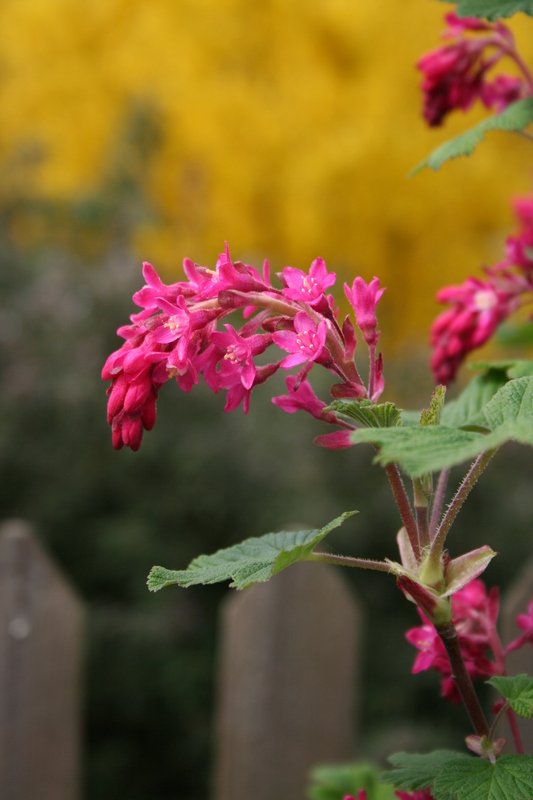 My mother first introduced me to this plant after growing it from seed but my own plants were collected from an abandoned Cornish garden in the village where my Grandmother lived. 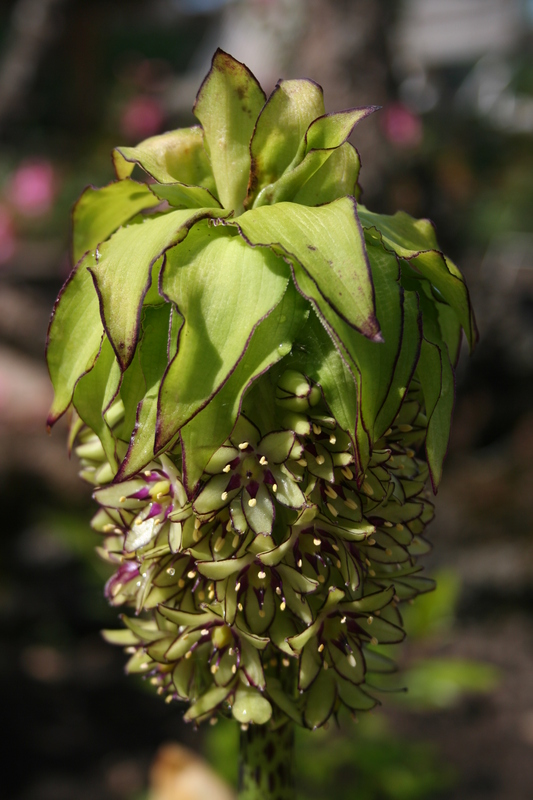 From her garden came our plant of Eucomis bicolor, a bulbous perennial which has proved its hardiness by surviving a spell at -26C last winter. I rescued it from a pot in the garden nearly a year after my Grandmother had died and treasure it as a memory of her. It has the most amazing flower spike, the form of which gives it its common name of Pineapple Flower. 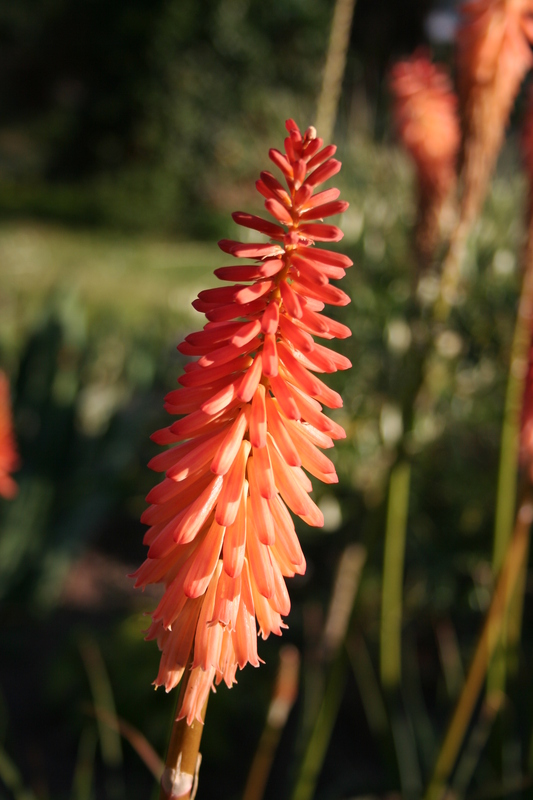 Barely three paces away we come to our next subject, a clump of Kniphofia Timothy with grass like leaves and bright orange flowers. The Red Hot Pokers seem to withstand anything when established but we did loose young plants, including divisions from this one, during the late winter cold snap. Further on, at the end of the bed and struggling under a large variegated Miscanthus grass, the South African succulent Lampranthus, with outrageously bright pink flowers, opens its buds in the sun and closes them every evening or on dull days. We have a much better plant in full sun in the front garden. On the opposite corner of the island bed we grow Hemerocallis in two varieties; elsewhere in the garden we have another three. I always assumed some Day Lilies were South African but now know this is not the case: you live and learn! I thought I was on safer ground with the next plant as Canna could not look more typically South African– except that it is from America! 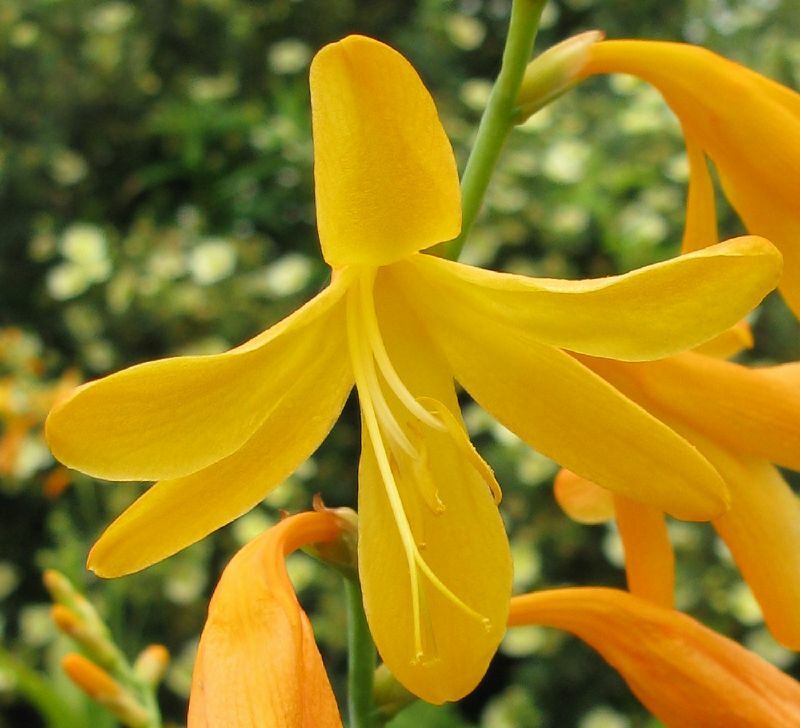 Fortunately we also have Crocosmia in the bed, and this really is from South Africa. One of our clumps is of an attractive orange-yellow colour and labelled George Davidson but may not be. Whatever the name, this Montbretia is a cheerful thing and battles gently with the neighbouring Salvia uliginosa, which towers over it. Unless I’m much mistaking (and to err is the gardeners’ lot) that completes the list from the island bed and the border on the west boundary offers nothing at all. 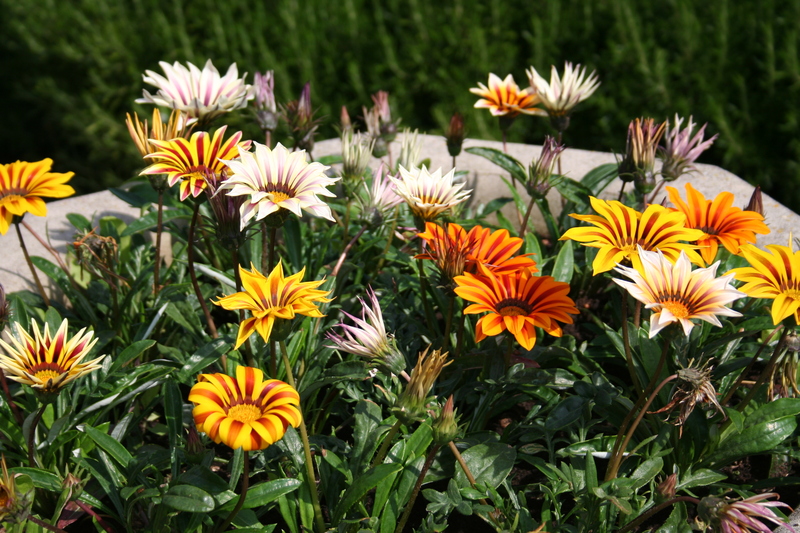 Alongside the eastern boundary and the swimming pool we do better with Gladioli – both species and Dutch florist types – and a number of bedding plants including Gazania, Diascia, Dimorphotheca and Felicia. Several Salvias hail from these parts but I don’t think any of ours do. In pots we have plenty of Pelargoniums which I think it is safe to add to our South Africa list, and in the front garden Phygelius in three varieties. I keep planting Agapanthus and they keep dying on me and a big potted Clivia went the same way as the Nerines, which is to say, they too are no longer with us. I am looking forward to meeting our students from Pretoria in September and hope they will not be too appalled at my attempts to grow South African native plants. 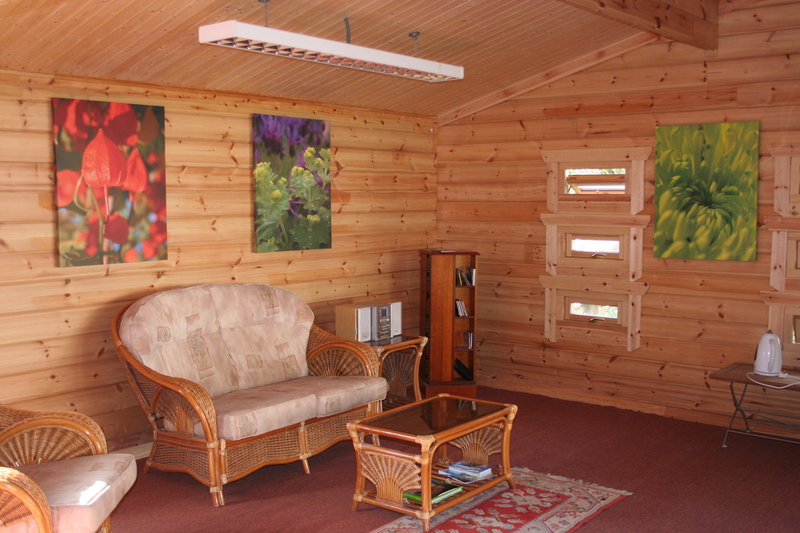 When Academy students are not in residence we like to make our rooms available to paying guests who are offered bed, breakfast and evening meal. One such guest stayed last night, an English lady with impeccable French, who has been living in the Chinon area for many years. It was during a pleasant meal, comparing notes on life in France and swapping amusing anecdotes, that we were introduced to the concept of illegal grape varieties. She had tasted a wine made from the grape Clinton (we finally arrived at the name after considering a number of American presidents), a variety reputed to drive drinkers mad but which clearly had not done so in her case. All of this was completely new to me and sounded quite unlikely, so today I have been investigating with increasing amazement at what I was reading. Politics, big business interests and horticulture can make for a heady mix. Firstly, the botany. All European wine grape varieties are derived from a single species: Vitis vinifera. The United States has sveral grape species including Vitis aestivalis, Vitis rupestris, Vitis riparia, Vitis rotundifolia and Vitis labrusca. An Asiatic vine Vitis amurensis, is also of interest. Both naturally occurring hybrids and deliberate crosses have been made between the species and varieties and Clinton is one of these, a spontaneous cross between the North American species Vitis riparia and Vitis labrusca dating back to 1835 when it was discovered in New York State by High White. In 1840 European vineyards were ravaged by Powdery Mildew disease and the search was on for hybrid varieties combining the qualities of the European grape with the disease resistance of the American species. While early in America’s history the trade was in European varieties to grow in the new lands, gradually the trend was reversed. In 1873 it was discovered that Phylloxera had been imported along with the American plants. 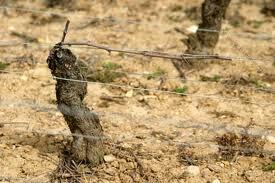 This root pest went on to wipe out the European vineyards. At the darkest hour for European vine growing it was discovered that some American varieties were resistant to Phylloxera, in addition to protecting against Powdery Mildew and Mildew. By grafting the “noble” European varieties onto rootstocks of American hybrids, total disaster was averted at the last moment and the wine production industry saved. In addition to Clinton, varieties included Noah, Othello, Oberlin, Baco, Herbemont, Jacquez and others. By the 1930’s the population of France was 35 million; wine production was around 91 million Hectolitres! There were huge problems associated with overproduction alongside alcohol related health issues and the French government were unsure how to deal with either. The result was a carrots and sticks approach, grants and propaganda on the one hand and series of poorly thought out laws which, amongst other things, banned the growing of the American hybrid vines. As late as 1950 posters were produced suggesting the wine made from these varieties was inferior and there was dark talk of Methanol and other dangerous chemicals found in the wine. The myth of poisonous foreign varieties undoubtedly helped protect the interests of large producers, while discouraging home production and folk memories persist in tales of “mad wine”. While mad wine is not a feature in any of the Garden Design Academy courses on viticulture, quality wine production is. This afternoon a Christmas fete was help in Saint-Romain-sur-Cher and we took the opportunity to visit the village wine co-op. We tasted a few and bought a few boxes, discussing their wines and the growing season with very knowledgeable staff. 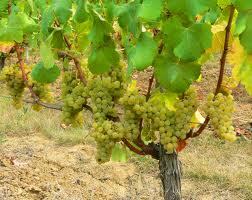 A white made from Sauvignon Blanc had been awarded a gold medal this year and was very good. We also tasted their Gamay primeur and asked them about our recent observations of this wine at the Montrichard wine festival. We had identified a taste we were unhappy with in at least half of the dozen or so wines we sampled at the festival and we were told that it was a production problem, caused by the late rains initiating disease and a lack of due care in harvesting. Here they harvested only a small part of their Gamay crop for the Primeur, picking by hand and selecting only the best fruit. There was no “off” taste in this wine; something else we have learned this week. At the end of our visit we walked the dog amongst the vines where pruning was well underway, single Guyot style. The soil was very sandy but with flints derived from the limestone beneath. Wine production is a complex process involving both plant culturing and manufacturing and we have students in the UK and as far away as New Zealand studying the subject with us. I admire their courage and hard work and celebrate the result when it is a good as the wines we tasted today. At the end of a beautiful, warm and sunny autumn week, we decided to visit the tiny village of Villentrois, near Valencay, at the northern tip of the Indre department. The village (population 625) had a thriving mushroom growing industry until recently, utilising the caves created during the excavation of Tuffeau limestone for building materials. 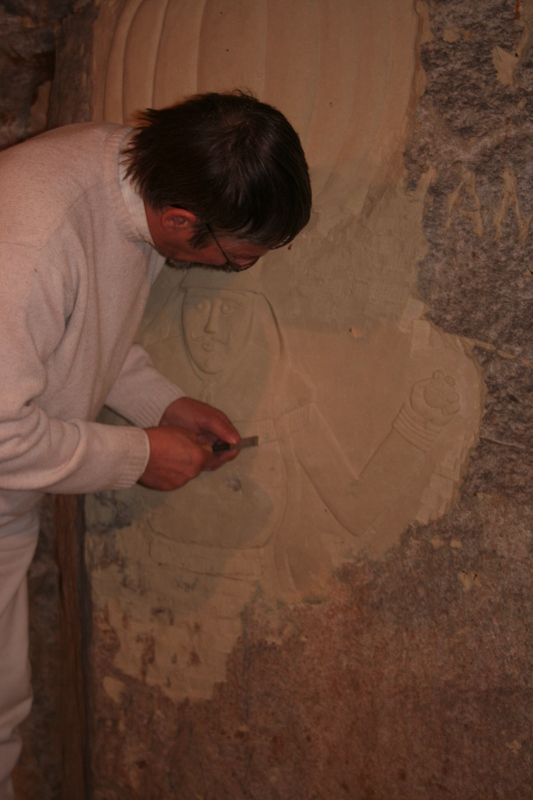 The whole village, including the ancient castle, is made of this soft white stone and it has been used for restoration work on the great chateau at Chambord and other historic buildings. One of these old mushroom caves is now a village hall and hosts events including the annual flower show, held this weekend. It is a happy, unpretentious affair attracting locals and day-trippers from further afield, who can also eat a hearty meal from tables set up for the purpose in one of the larger galleries. 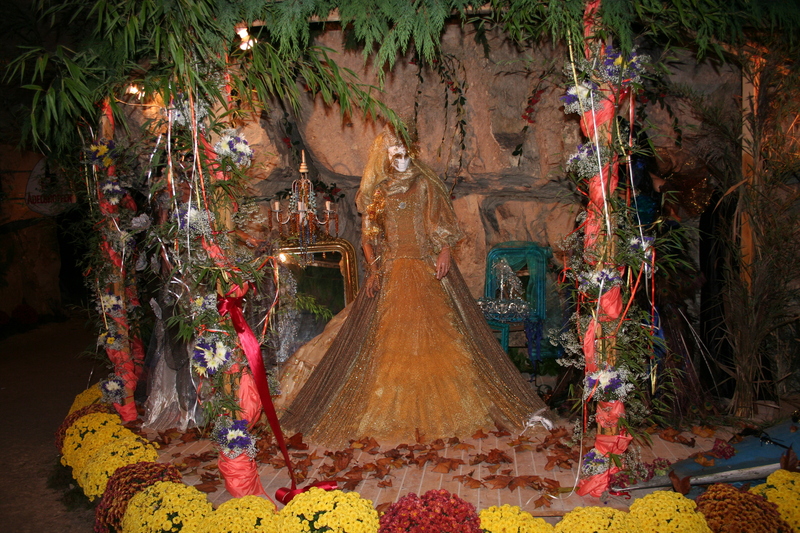 The school children and the library construct themed floral exhibits and local nurserymen, landscapers, florists, producers and artists sell their wares from decorated stands in corners around the caverns. The walls and ceilings are decked in foliage and fairy lights while the pathways are lined with flowers, softening the chilly atmosphere. Chelsea it is not, but it brings a smile to the faces of the visitors and on such a lovely Sunday afternoon it was certainly drawing in the crowds. Mushrooms are still produced in the artificial caves of the region, although it is not the cottage industry it once, deferring to the more efficient industrial producers who make up the bulk of my students on the Garden Design Academy Mushroom Growing course. We have had some interest in it recently from English owners of houses in France who, discovering they have a mushroom cave or troglodyte shed in the back garden, decide to make use of it. The French are generally keen to support local growers, so some have found a profitable niche market, selling to restaurants or shops and keeping the food miles down. These caves are ideal for mushroom production, but also make great wine cellars for much the same reason: the rock caverns provide very stable temperatures and great insulation. Some are lived in and they can make very cosy dwellings. Mushrooms have been the subject of much debate in the gathering places of the area this week. The woods outside Valençay have become temporary home to more than 50 caravans, as gypsies arrive from around the country to hunt for wild mushrooms, especially Boletus edulus – the Cep. Selling at around 25 Euro a kilo and up to twice that in Paris, they are being collected by the lorry full to sell in the capital, damaging large areas of private and public woodland in the process. Given that these woods are important sources of revenue as hunting grounds in addition to the timber and associated products, a serious conflict could be on the way. We discreetly collected a few Ceps on the way home, but in quantities unlikely to upset the natural balance of the woods, or the tempers of the landowners. After a tiring but satisfying week teaching a residential garden design course here in Chabris, we took ourselves off to the South of France for a part work / part holiday break. 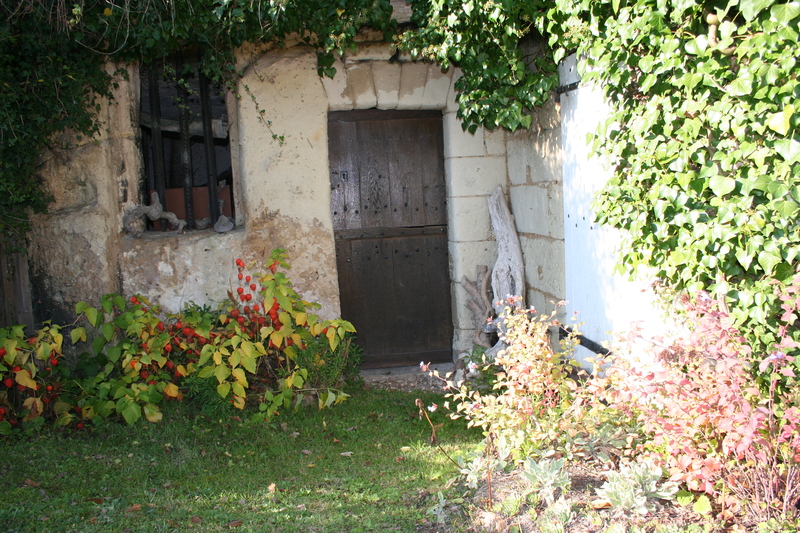 Our base, after a little touring around the Languedoc-Roussillon, was Pézenas, where a client put us up at their vineyard Gîte Rural while we discussed the creation of a new garden around their house. This arrangement also allowed for plenty of time to visit the region with our son, who flew over to join us. Roquebrun - Jardin Méditerranéen - perhaps next time? I had planned to take in two local gardens but discovered that our first was available for evening guided visits only and this did not suit our schedule. 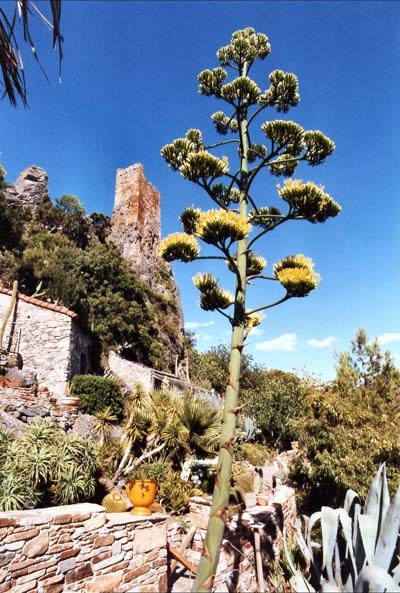 We reached the village of Roquebrun in the Hérault to seek out the Jardin Méditerranéen but were distracted by a pretty restaurant and in the end did not make it to the garden. We did however, discover the local wine co-op where a steady stream of growers were delivering their harvest. After some debate and careful consideration, we eventually departed with two dozen bottles of their finest. This region of France is particularly attractive when the temperatures moderate and the tourists leave. We swam in the Mediterranean and looked at the boats in the harbour at Sète, enjoyed a wonderful meal in a village on the edge of the Bassin de Thau and strolled by the Canal du Midi. We were particularly taken by the hills and mountains of the huge Haut-Languedoc Natural Park behind the coast. The stunning scenery and an amazing diversity of countryside, geology and climate had us captivated for several expeditions, driving around mountain roads and through tiny mountain hamlets. We should have walked more I know, but the dog had a foot infection and was effectively lame for the whole trip, although she enjoyed our swims in lakes and rivers each day. 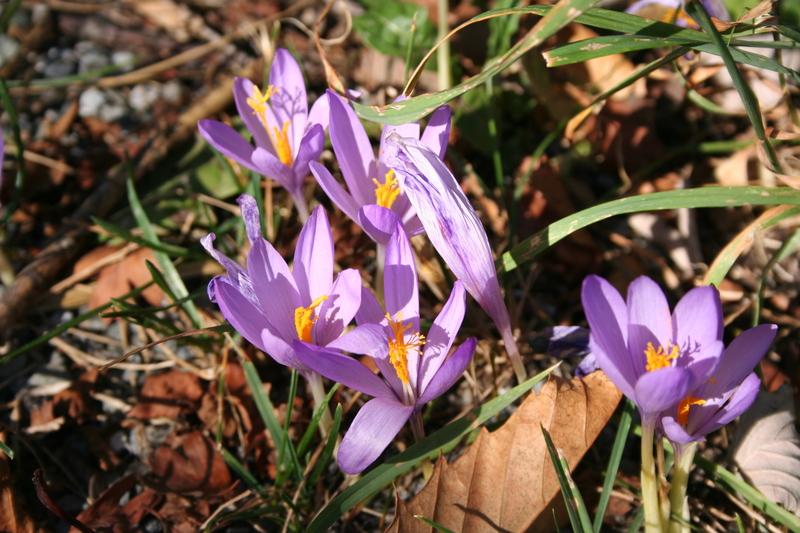 One area consisted of a forest of Chestnut trees as far as the eye could see (and probably much further) and locals were busy bringing in the bounty, while in another, more open region, the roadsides were flecked with saffron crocus. All good things come to an end and eventually we had to make our way home, after lunch next to the brick cathedral at Albi and a night in a farmhouse above the River Lot. We arrived refreshed and ready to work again, with a garden design to complete and, amongst the 2,000 emails sitting in my Outlook Inbox, a few more requests for courses. The first signs of autumn were evident in the garden. Less tourism and more gardening in my next post, I promise!